For the past 7 years or so, I've been doing fun things with XScreensaver to make custom screen savers that display useful information. 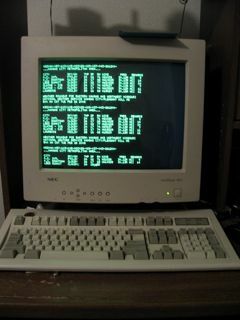 My favorite XScreensaver mode is Phosphor, which renders olde-school green text on your screen. By default, it just displays information about your system such as system load and host name. While that's fun and all, it's pretty boring for a desktop system. So, I'm a weather geek. Part of the reason is because I like being outdoors, but even when I'm cowering inside on a blustery February morning, I like to know what the weather is doing. On my FreeBSD lab machine, I configured Phosphor to display the hourly National Weather Service data for my area. Obviously, you need to download and install XScreensaver first. You can do this using whatever means you want, but on FreeBSD, it's as simple as "sudo pkg_add -r xscreensaver". This fetches the weather data (without a list of links and stripped of HTML) for the eastern KS/northwest MO region, grabs the lines I want, then puts it in the .wx file in my home directory. This runs 7 minutes after the hour, every hour, every day. Of course, you could use a similar script to do an hourly scrape of the front page of your favorite news site, or run any program that will generate a text file for Phosphor on a regular basis. Now that we have the weather data (or whatever else you want) coming to us every hour, it's time to configure xscreensaver. First, make sure "xscreensaver&" is included before the window manager starts up in your .xinitrc or .xsession file, depending on if you're using an X Display manager or just startx to launch X. Notice how the display has that cheesy-yet-familiar phosphor persistent delay? I love it! Sorry this didn't capture very much of the screensaver, I'm trying to figure out why xvidcap keeps crashing on FreeBSD.